There has been a bit of a change around on some of the Volvos at Plymouth Citybus. 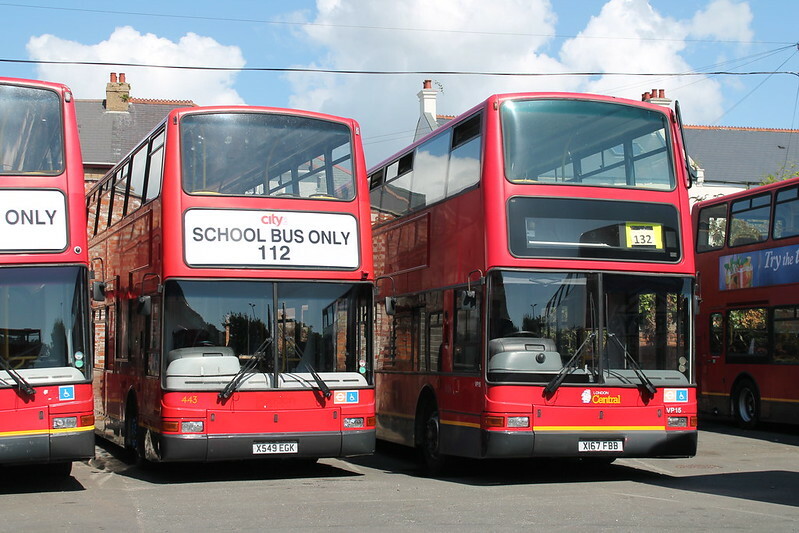 443 X549EGK was lettered up for the School Bus 112 service but has now been lettered up for Driver Training. PUBLIC TRANSPORT EXPERIENCE: fbb's Steyning Day; NOT Stenning, Ray. The line soon settled down to its bucolic obscurity but it never achieved "main line" status as originally intended and only carried passengers to and from these local stations. We can "survey" the line and see what remains. Fortunately most of its length is now "The Downs Link", a long distance cycle route and footpath. BRITISH BUS BUGLE: Suffolk County Council There is no county-wide map. We do have a page listing each are of Suffolk, where if you click on an area, you see timetables for all routes and a basic route diagram. Some diagrams are easier to follow than others however. DENNIS BASFORD: ‘Scene’ briefly in Melton Mowbray It is almost a rear and a half since I last visited ‘MM’ so I thought that another visit was due. A North Leicestershire town which lies at the crossroads formed where the A 606 Nottingham to Stamford road and the A 607 Leicester to Grantham road intersect. BENJIS BUSES: 14-64 Plate Buses With the new registration upon us we've decided to try and do a weekly update again as this proved fairly popular the last time we did it! YARMOUTH BUS PAGE: Old Buckenham Bus Rally Look at the EYMS website for the pdf for the current 160/162 timetable and the timetable available is dated 15th August 1999. The two services run on Wednesdays and Saturdays linking various small villages into Goole and Howden. FOCUS TRANSPORT: LONDON UNDERGROUND BAKERLOO LINE EXTENSION Plans for the long-awaited extension of the Bakerloo line are set to take a significant step forward next month. Transport bosses will start a ten-week public consultation on extending the line to parts of south-east London historically poorly served by the Tube. PUBLIC TRANSPORT EXPERIENCE: fbb's Steyning Day; NOT Stenning, Ray. But, grab your bike or pull on your walking boots and the Downs Link will take you most of the way. No trains, no track but a few bridges and other remnants will, if nothing else, remind you that this was a working railway. IAN VISITS: Museum Meals – Museum of London It’s almost too easy to miss the larger cafe on the way out, for despite being next to the exit, and the cloakroom it doesn’t really protrude into the foyer in a way that might make it more noticeable. That it also comes after most people might have stopped at the smaller cafe on the lower floors probably doesn’t help in drumming up passing trade. LANCASTER OMNIBUS: Stagecoach Finally Takes on Fishwick The new Stagecoach timetable leaflet doesn't show the Fishwick journeys but, surprisingly, Return tickets are still to be interavailable between the operators and something called the Walton Park Routerider will continue. J Fishwick & Sons, with its prime operating territory, has led a charmed life up to now but The Man on the Lancaster Omnibus wonders if this is just the start of something bigger. IAN VISITS: New Routemaster gets Guitar Branding Another of London’s new Routemaster buses has been given an advertising makeover — this time by the guitar brand, Fender Stratocaster, which is marking its own 60th anniversary this year. CIRCLE OF LONDON: Metroline Harrow Weald Garage [HD]...VWs for the 140/640 Located right at the pinnacle of Harrow is my local garage Harrow Weald, which is operated out of by Metroline and has done so for as long as I can remember. Although the garage at present only runs three routes, two of them are the busiest routes in Harrow. For years the garage has solely operated bus types but only on the Plaxton President body, however that is about to change and in this case change is good. PUBLIC TRANSPORT EXPERIENCE: fbb's Steyning Day; NOT Stenning, Ray. Sounds a bit American? In the UK "transit" has been used, historically, for the action of "crossing", as in "the transit of Venus" describing the passing of the planet across the face of the sun. STEVES BUS AND TRAIN PAGE: Midweek Round Up 26/8/14 So now the decision has been taken to repaint 33423 into X1 livery. To rob it of its individuality and paint it like 24 others. Correction 26 others as apparently 2 of the former X1 Geminis are getting the same treatment. The question that is screaming out is in the name of all that's holy WHY????? 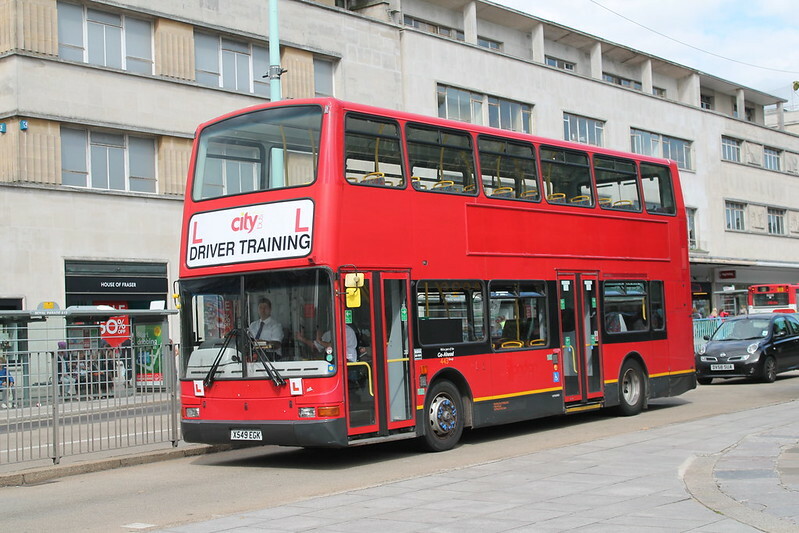 BRITISH BUS BUGLE: Report rues deregulation The big difference in London of course is the level of subsidy the bus network receives, which is per capita far in excess of that granted to any other region of the UK. 215 and 216 are withdrawn too. Thank god for that! I drove 215 at the Driver of the Year event in July and it was absolutely horrendous. Really awful brakes, very cramped cab and poor visibility. An absolutely horrible drive - I'm so pleased if I become a driver I won't have to pass my test on them; to be fair I'm surprised anyone could on those things! Why we're some of the buses sold on so quickly?,also are they going to be replaced what with all the withdrawals going on at the moment?. Bit unfair about 215. Used to be the best of the trio. Also how can the cab be described as cramped in comparison to the deckers being used as the current trainers? Finally, good to see 'withdrawn' Darts 14 & 15 back in service today (4th September). Another 'withdrawn' Dart no.10 was back in service on routes 40 and 41 today (Tuesday 9th September).